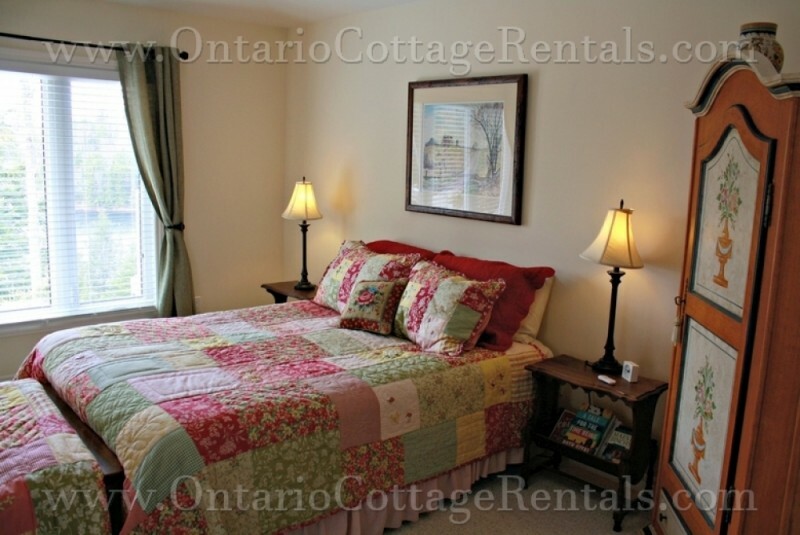 Treetops Cottage is located on a private lake in Haliburton County. 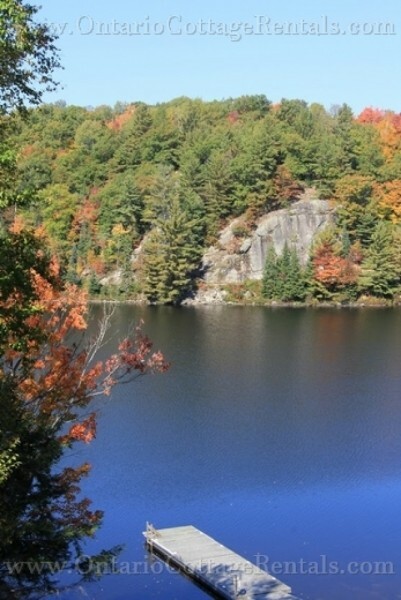 Growler Lake is known for its excellent fishing, breathtaking views and clear water. Close to the small town of West Guilford, and nestled along the hillside amongst 46 acres of private land, sits this 4,000 sq. 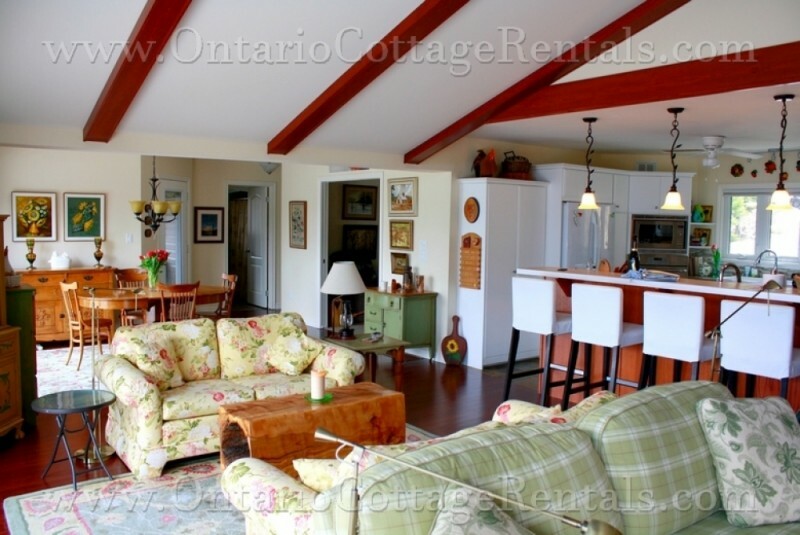 ft. four-bedroom, four-bathroom cottage. 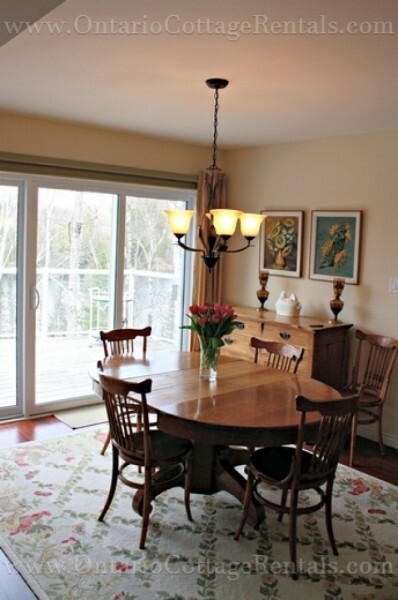 The large waterfront facing windows give panoramic views of the lake and surrounding forests. Treetops Cottage is the perfect getaway for an active outdoors loving family, with the addition of luxurious living space. The main floor features a large and open space containing the living room, kitchen, and dining room all in one. 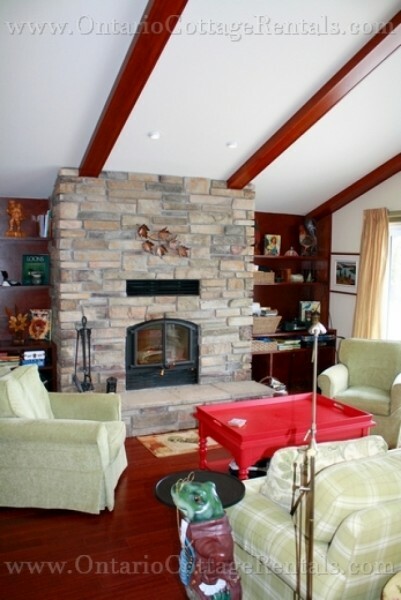 There is a beautiful wood burning fireplace with couches and side tables situated about the room. The living room opens to the kitchen which is equipped with a bar table top and four stools for extra seating. There is a large pantry, bar fridge, gas stove with two ovens, additional wall oven and double fridge with a freezer for maximum storage. Guests are welcome to try out the Soda Stream machine for a healthy soda alternative. 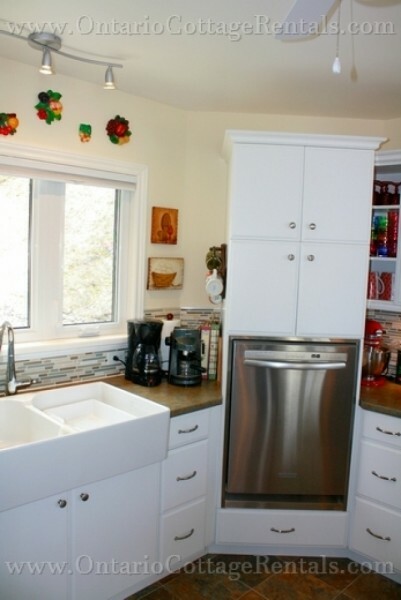 The kitchen is well equipped with all utensils to make meal preparation quick and easy. Over to the left of this large space is the dining room with a dining table that can seat eight to ten people. 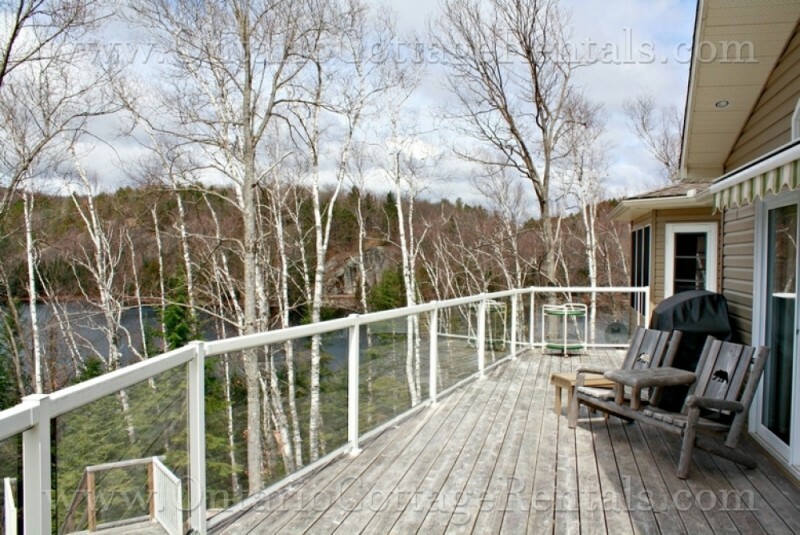 The space has a wall of windows that look out to Growler Lake and its surroundings; breathtaking is an understatement. The main floor is also home to the den. 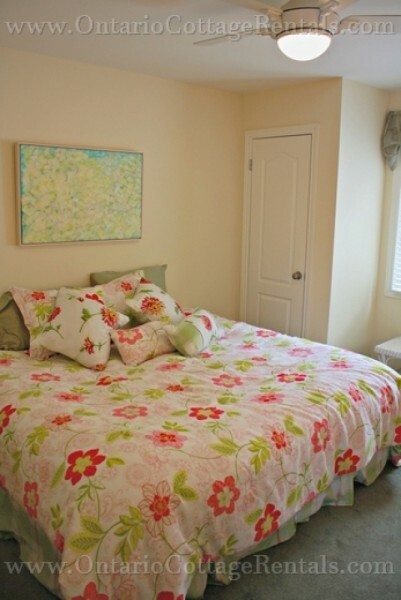 This room is easily converted from an extra living space to the fifth bedroom. There is a comfortable pullout placed in the middle of this cozy room with a 42’ flat screen television. Two of the four bedrooms are also on this level: one with a king bed which can be easily converted into two twins and the other containing a queen bed and master ensuite bathroom. There is a second four-piece bathroom also on this floor. At the far end of the main level is the beautiful Sunroom. 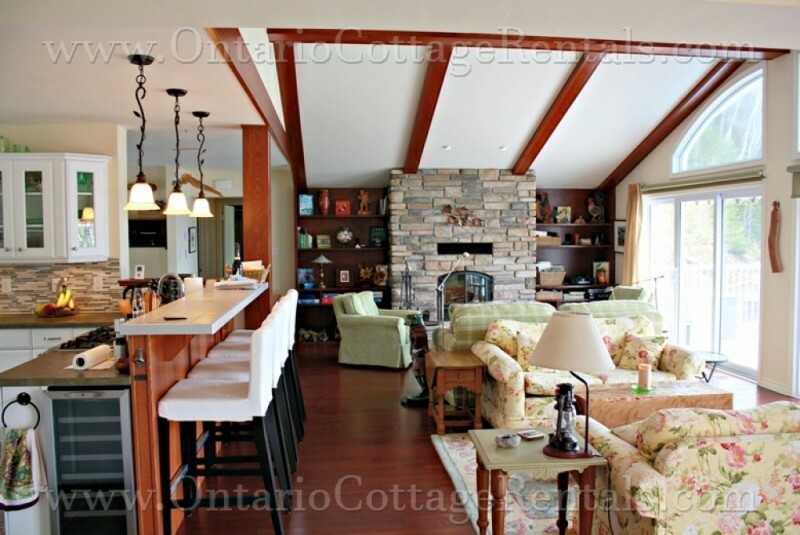 This room is separated from the rest of the cottage and is the perfect spot for finding peace throughout the day, enjoying card games or simply extra seating. 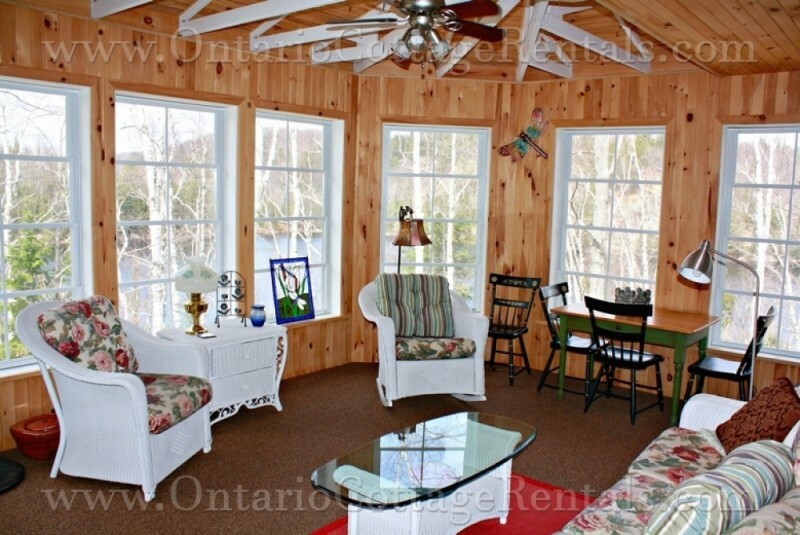 The Sunroom is a three season screened in porch and has one of the best views in the cottage. The front deck, which is accessible off the main level is forty feet long and is has a barbecue and seating for guests to relax while waiting for dinner. The lower level with a walkout to the front lawn has a lounge area with two double leather lazy boy recliners, a 50’ flat screened television and a craft table. At the other end of the lounge is a game table with four chairs, perfect for puzzles and card games. There is also a wood stove and two leather chairs with foot rests for guests to sit back and watch the happenings throughout the room. Both the third and fourth bedroom are located on the lower floor; one offering a queen sized bed and view of the front lawn, and the other containing a double bed and crib, perfect for children. This bedroom is just across the hall to a very large bathroom equipped with two sinks, a toilet and a large stand up shower with a tub. 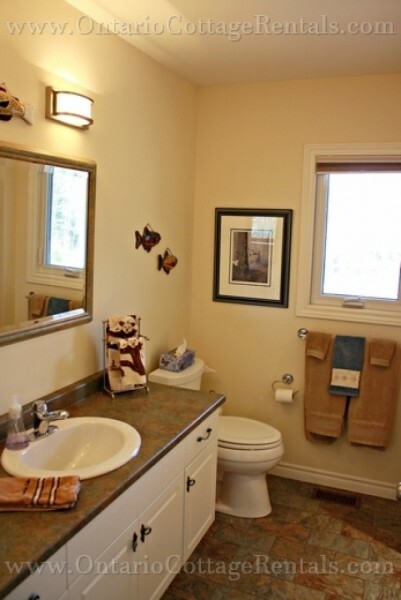 There is also another four-piece bathroom on this lower level. Outside to one side of the lawn is a shed containing the water toys, a picnic table, a swing set for the kids, and a fire pit surrounded by a bench and wood stools. 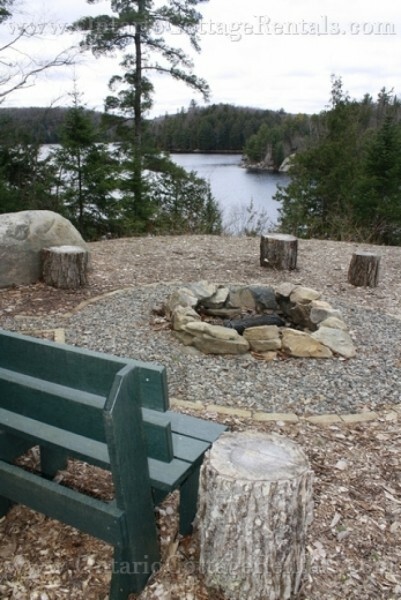 This spot is ideal for marshmallow roasting and star gazing and will prove to be the perfect location for recounting the day’s activities. Here there are the stairs that lead down to a spot known as the ‘Sunset Dock’ and a short walk further down a path will bring guests to the main waterfront. This area features a sandy gradual entry for children as well as a long dock that floats out making that refreshing dip into the water much more accessible. There are 520-feet of waterfront to be enjoyed and explored. 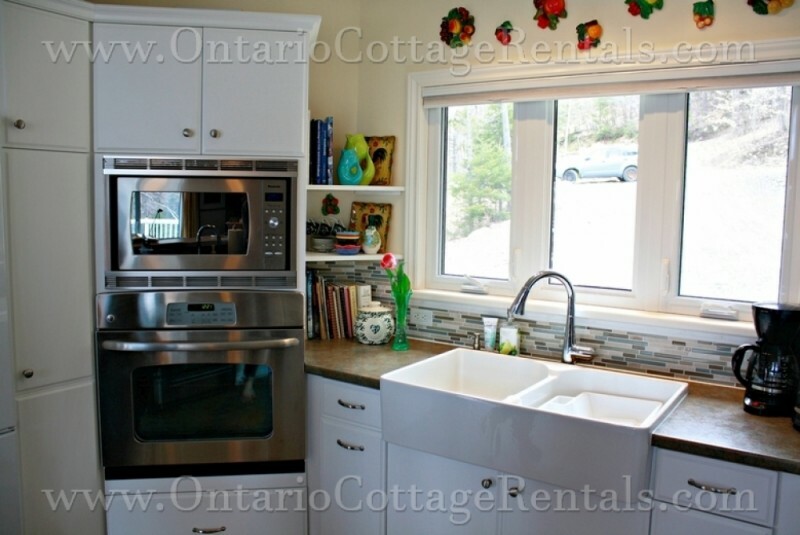 Treetops Cottage is not only located on one of the most beautiful lakes in northern Ontario, it offers a perfect space for a family who is looking to get away from the fast paced world and surround themselves with all of the natural wonders of cottage country. $1,680 per Holiday Weekend in Off Season - 3 Night Stay. 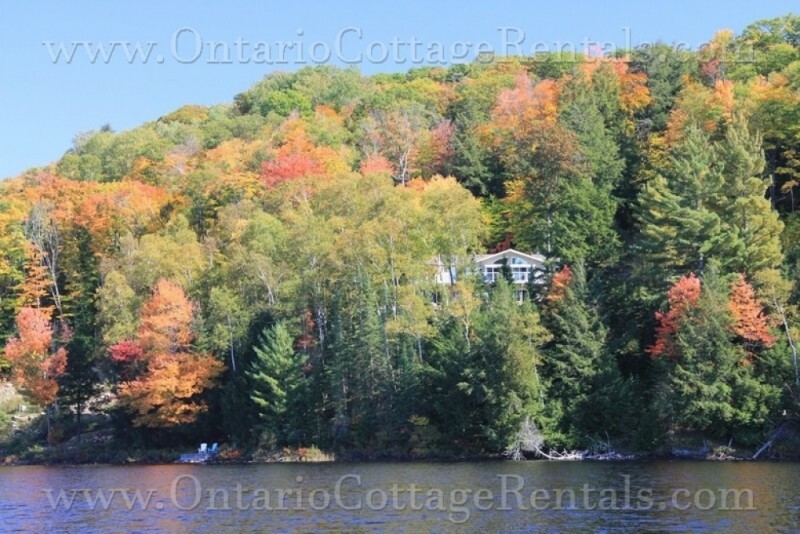 $1,090 per Regular Weekend in Off Season - 3 Night Stay. 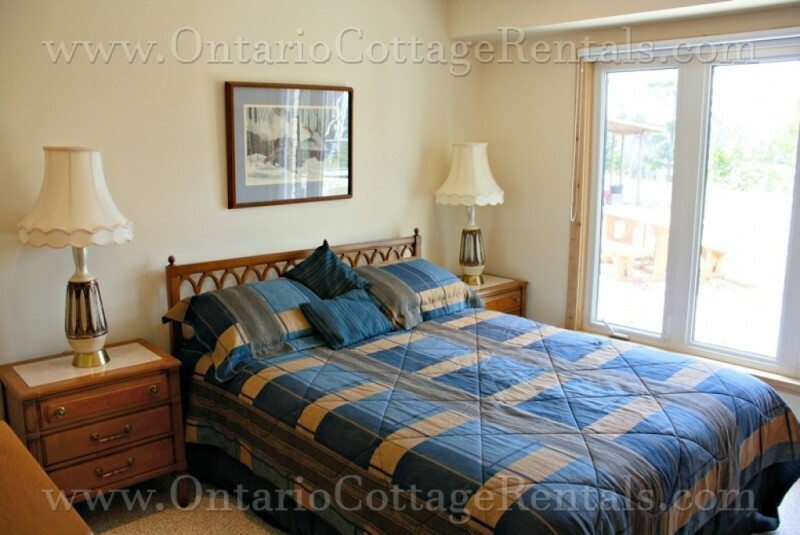 $900 per Regular Weekend in Off Season - 2 Night Stay. $1,000 refundable security deposit required. High-Season includes the last full week of June to Labour Day Monday, as well as the week of Christmas and New Year's.